This Endon Piccadilly touch dimmer table lamp with taupe shade in soft brass finish is simple, stylish and practical. Featuring a vase like body and 9″ taupe fabric shade, with three stage on / off touch dimmer switch; simply touch for on, again to brighten or dim and once more to switch off. A practical and convenient addition to any bedside table, office desk or living room as a reading or task light. 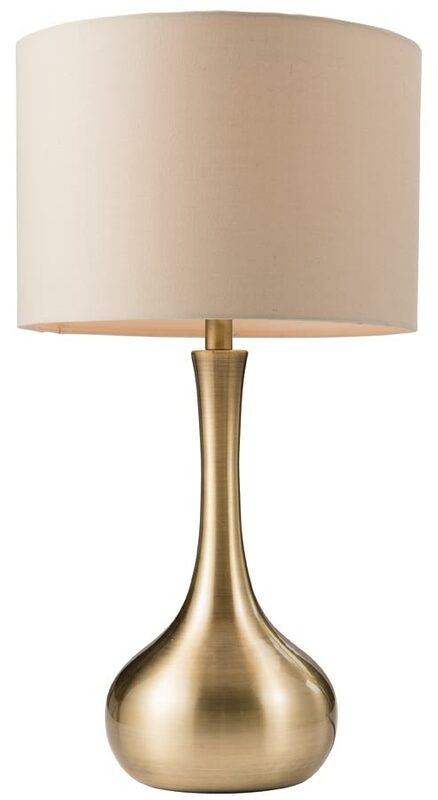 This small table lamp features soft satin brass plate and neutral taupe shade making it suitable for contemporary and traditional spaces alike. The touch dimmer function is a welcome addition to those of us who want convenience and practicality. A stylish table lamp that is perfect for use as a bedside lamp or in your living room next to your favourite chair. Class 2 double insulated, no earth required and takes a 40w candle lamp bulb (not supplied). There is an alternative satin nickel finish available, please see below. Manufactured by Endon Lighting, a design led business who lead the way in style and innovation to create an impressive range of products such as the Piccadilly touch dimmer table lamp with taupe shade in soft brass finish you see here.